Our kids' school is an International Baccalaureate (IB) Candidate school, one of three in the district. We have received a few updates in the school newsletter, but I still didn't really understand what it all meant, so I was pleased to be one of the parents invited to lunch with the IB consultant last week. IB = International Baccalaureate, an international program. IB started in 1968. PYP = Primary Years Programme, the IB program designed for students aged 3-12. PYP was introduced in 1997. A word that was repeated often in the conversation is "inquiry" (and "inquirers"). My understanding is that IB is about teaching thinking skills: getting the children to ask questions and then help them discover the answers. Rather than a teacher lecturing and giving a single correct answer, the students explore and find answers. 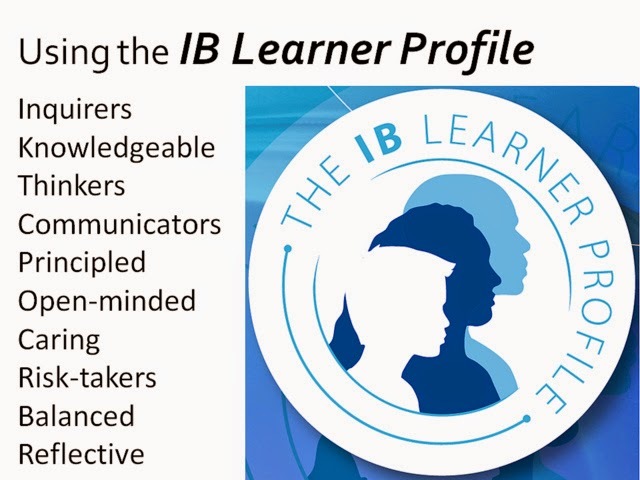 IB Learner Profile image, copyright Clint Hamada, CC license, some rights reserved. There were lots of details about PYP: the 6 transdisciplinary themes explored through the year, the emphasis on local and global issues, the learner profile, language learning. I'm not sufficiently knowledgeable to explain all that (the PYP section of the IB website has lots of information). IB and PYP is about thinking skills. At least at our school, this isn't a radical change. The teachers won't really have to learn a new way of teaching since many of these practices are already used in the school; instead, becoming an IB school means changing how the curriculum is organized. Teachers were already coordinating within grade-level; with IB, they are now coordinating vertically, across all grade levels. Our school has already had a global emphasis, partly due to the large international population. IB will enhance that. One question that came up is how all this fits in with the current climate of standardized testing. The short answer is that the school has to comply with state laws and will continue to do required standardized tests. Since IB is about the how of teaching rather than the what, students will still learn the required standards. Do I think this is a good program for the school? Yes. Do I think it's a good fit for this school? Yes. Earlier today a friend shared this article on Facebook. There have been many studies and articles in the past few years addressing this topic. Despite all the research, legislators keep pushing for more and more standardized testing, which emphasizes the academic goals mentioned in the article. Rote memorization. Facts. As I read the article, though, I immediately connected it to the conversation on IB. Because the intellectual goals mentioned? Those are the goals that IB has. Reasoning? Check. Hypothesizing? Check. Posing questions and predicting answers? Check and check. Quest for understanding? You bet.